Possibilities are HF contacts, VHF/UHF satellite contacts, or linking to the local VHF RTTY repeater. "Daylight Express" is still a possibility, but requires a lot of work and coordination. Spare time for implementing these projects seems to be one of the basic problems~ yet there still seems to be a desire to continue advancing the state of packet radio. So, how do we move to the next step? HF packet seems to require more equipment, and is limited by the FCC due to transmission speed requirements and an Advance Class ticket. This limits the use of HF packet for the "mass". 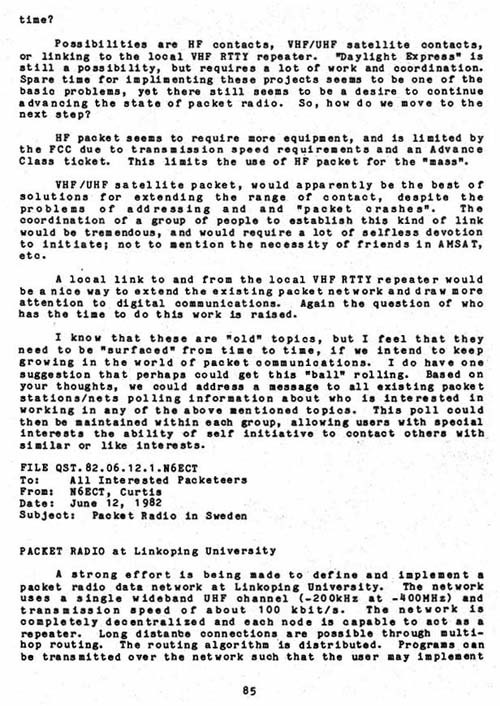 VHF/UHF satellite packet, would apparently be the best of solutions for extending the range of contact, despite the problems of addressing and and "packet crashes". The coordination of a group of people to establish this kind of link would be tremendous, and would require a lot of selfless devotion to initiate; not to mention the necessity of friends in AMSAT, etc. A local link to and from the local VHF RTTY repeater would be a nice way to extend the existing packet network and d raw more attention to digital communications. Again the question of who has the time to do this work is raised. I know that these are "old" topics, but I feel that they need to be "surfaced" from time to time, if we intend to keep growing in the world of packet communications. I do have one suggestion that perhaps could get this "ball" rolling. Based on your thoughts, we could address a message to all existing packet stations/nets polling information about who is interested in working in any of the above mentioned topics. This poll could then be maintained within each group, allowing users with special interests the ability of self initiative to contact others with similar or like interests.